A collection of activities and games that can be used to teach elementary level students how to use 'some' and 'any'. This lesson plan includes suggested board work, several activities, a game and a collection of specially selected ESL resources from around the web. If you're an iOS or Android user, try this lesson out on our TEFL Handbook app. It gives you offline access to all of our materials, perfect for quick reference in the classroom. The board work below illustrates one way to introduce the target language of this lesson. 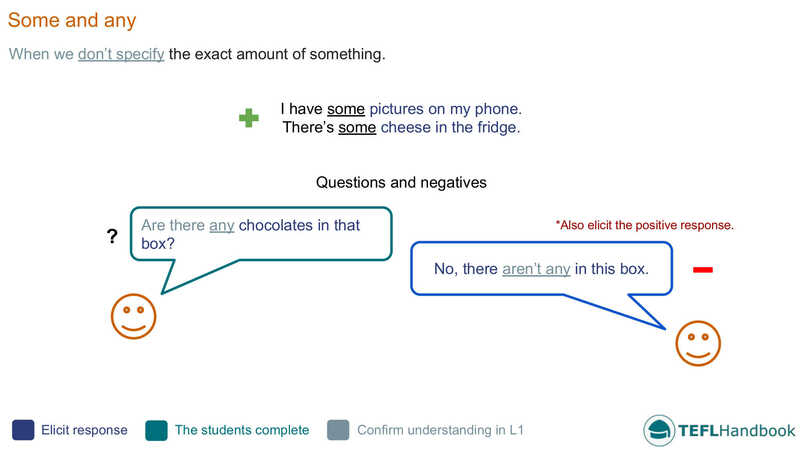 Step through each of the three usage rules(affirmative, negative and questions) eliciting as much as possible. Student A: Have you got any water? Student B: Yes, I’ve got some water? 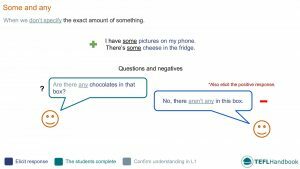 For this speaking activity, start off by eliciting different types of food from the students and add them to a list on the right-hand side of the board. Teacher: Did you eat any chocolate today? Teacher: Did you have any eggs for breakfast? Then have the students interview each other and record the results with ticks and crosses. 5-8 questions should be enough. Teacher: So what did you learn? Student: He ate a lot of eggs for breakfast yesterday, he didn’t eat any fruit or vegetables today. 20 points: Correctly spelt a word that the other team doesn’t have. 15 points: Correctly spelt a word that the other team also has. 10 points: Incorrectly spelt a word that the other team doesn’t have. 5 points: Incorrectly spelt a word that the other team has. We hope that you've found a few of these ideas useful. Our suggested next lesson is on using 'how much' and 'how many'. Be sure to check out our complete list of elementary level ESL lesson plans, A2 lower and A2 upper, as well as our entire collection of ESL lesson plans. Also, if you are an Android or iOS user, this lesson plan is available for free on the TEFL Handbook app. An ESL lesson planner for English teachers.